Around 100 people crowded into a protest rally Tuesday morning to listen to several young people, all recipients of Deferred Action for Childhood Arrivals, tell their stories. Several Dreamers, young people who've benefited from President Obama's Deferred Action for Childhood Arrivals program, spoke about the risks they face with that program's erasure. Anahi Araiza, a Dreamer with the activist group AJUA, leads a rally at Colorado Mountain College in Glenwood Springs protesting the revocation of Deferred Action for Childhood Arrivals program. The underlying message focused on the need for the 2017 Dream Act to pass quickly, providing permanent protection for dreamers. 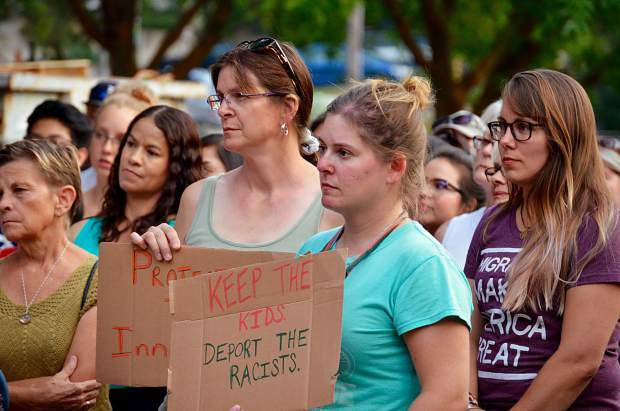 Protesters rallied outside Glenwood's Colorado Mountain College building Tuesday evening after news came earlier in the day that the Deferred Action for Childhood Arrivals program was being rescinded. After Attorney General Jeff Sessions announced the rollback of Obama-era protections for undocumented young people brought into the U.S. by their parents, a rally to protest the move quickly organized for that evening. 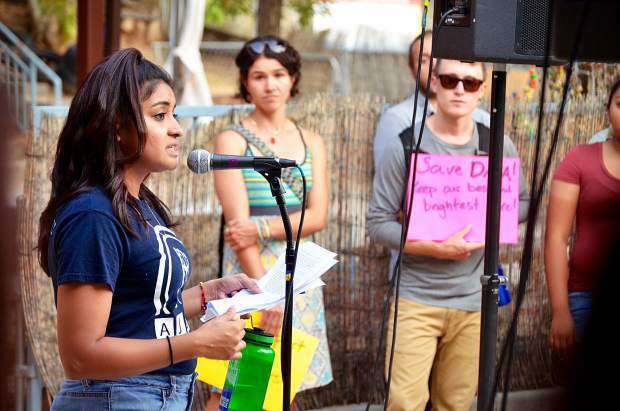 At a rally Tuesday evening in Glenwood Springs, Gabby Lopez, a local beneficiary of Deferred Action for Childhood Arrivals, tells a crowd of around 100 the story of how her parents brought her to the United States when she was only 6 months old and the threat she faces under DACA's revocation. 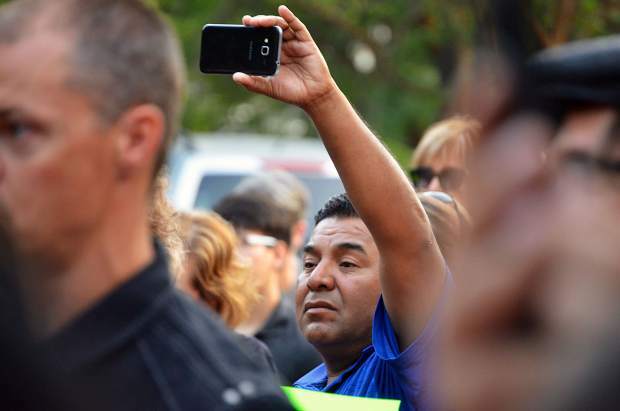 Protesters at the rally chanted:" When immigrant rights are under attack, what do we do? Stand up! Fight back!" With little notice protesters scraped together makeshift signs for the Tuesday evening protest rally. News that Obama-era protections for undocumented young people will be stripped was surprising to few, but still left many “Dreamers” reeling with uncertainty about their future in America. Attorney General Jeff Sessions announced Tuesday morning that the Trump administration would rescind Deferred Action for Childhood Arrivals, which protected immigrants who were brought into the U.S. illegally as children. Congress was given six months to pass some kind of protections for the young people that were covered by DACA. By Tuesday afternoon, Colorado’s senators, Michael Bennet and Cory Gardner, announced that they are cosponsoring the 2017 Dream Act, which would provide a pathway to citizenship for Dreamers. 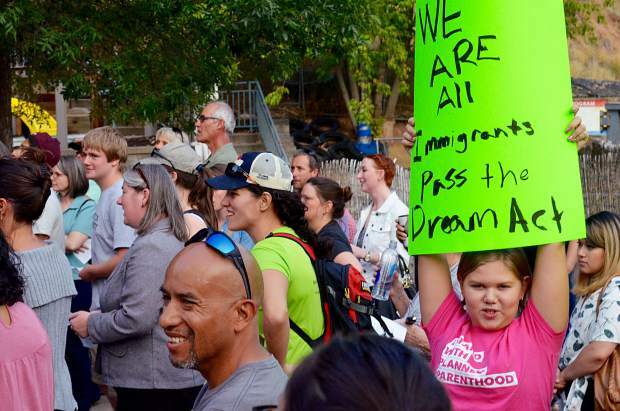 By evening, around 100 protesters had gathered in Glenwood Springs to rally against the DACA reversal. Several young Dreamers told the crowd their stories of being brought to the U.S. as children — sometimes infants — and the threats they face under DACA’s reversal. 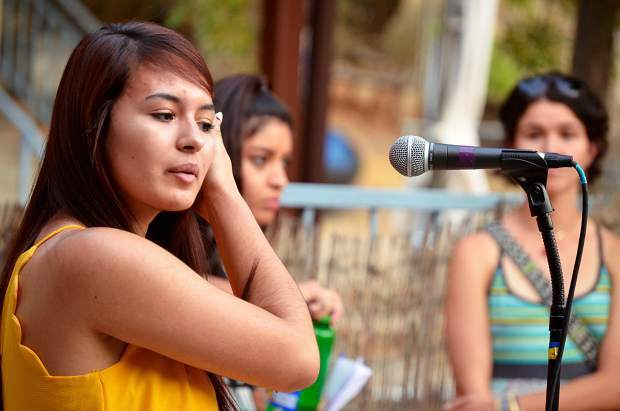 Gabby Lopez is a Dreamer who was brought to the U.S. at 6 months old. She’s been able to get her teaching degree while protected by DACA, but now she’s uncertain if she’ll be forced to go back to Mexico, a country she doesn’t know. Melissa Rodriguez, a Dreamer and Colorado Mountain College student, said that DACA had made scholarships and college possible for her. She’s about to graduate with an associate’s degree in business, and she wants to get a bachelor’s degree in finance. But she doesn’t know if that will be possible with DACA gone. “I’m undocumented. I’m unafraid because I’m here to stay,” she said to cheers from the crowd. “We’re not surprised,” Sophia Clark of Colorado Immigrant Rights Coalition said of Sessions’ announcement. “Nevertheless, this is totally unacceptable. It’s an attack on immigrant rights and young people in this country. The next step is we need Congress to pass the Dream Act right away. However, DACA was never the permanent solution, so the fate of Dreamers is now in the hands of Congress, she said. Rescinding DACA will affect an estimated 800,000 people who were given renewable two-year deferrals from deportation. In Colorado alone about 17,300 people are permitted to stay in the U.S. under DACA. Former President Barack Obama created the program by executive order after Congress failed to pass the Development, Relief, and Education for Alien Minors act (DREAM), which was meant to create a path to citizenship for undocumented immigrants brought to the U.S. before 2007 and before they were 16 years old. To get into DACA, Dreamers had to give the federal government extensive information about themselves, and now that same information could be used against them for immigration enforcement. U.S. Immigration and Customs Enforcement has already targeted Dreamers, such as those who lose their DACA protection by getting arrested for crimes such as drunken driving, Clark said. Alongside the Dream Act are some other bills in Congress promising protections for Dreamers, though Jennifer Smith, a Glenwood immigration attorney, said that she hopes to see real progress on these bills and not to see them used only for political gains. 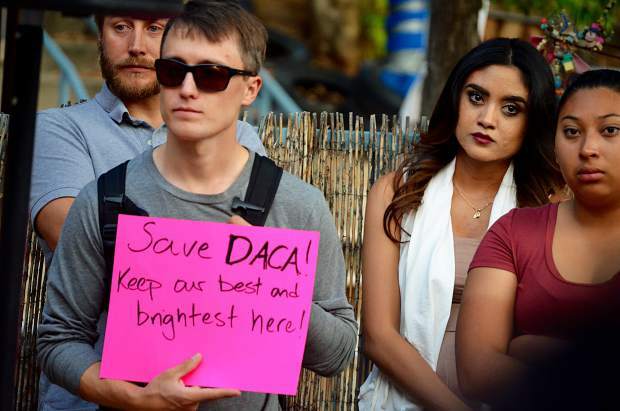 The whole reason DACA came to be was because Congress wouldn’t act to protect these young people, so it’s hard to say, “all right Congress, now it’s your turn,” Smith said. The Glenwood attorney also was frustrated with the way the DACA decision was announced. In his announcement, Sessions compared the young DACA recipients to criminals and claimed they’re taking American jobs, claims not backed up by reliable research, Smith said. 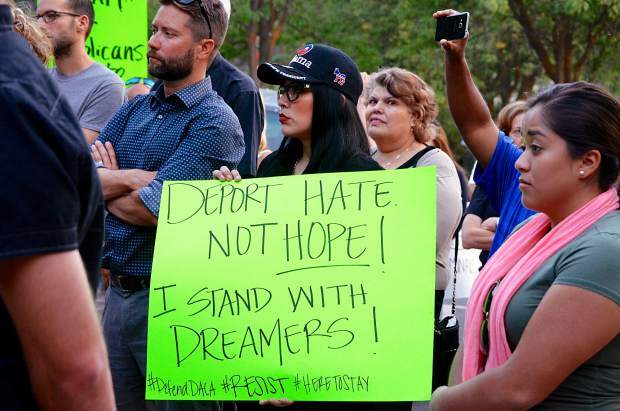 At the Tuesday evening rally, Smith also told protesters that DACA recipients will not be able to get Colorado’s undocumented immigrant driver’s licenses, which were passed into state law in 2013. Those licenses require immigrants to have a taxpayer identification number, which DACA recipients don’t have. Social Security numbers, which they do have, are not accepted. This is a problem that Colorado’s Legislature needs to quickly fix, she said. 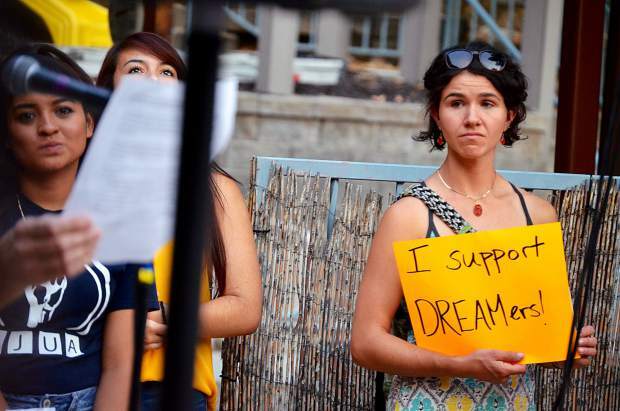 The overlap of the DACA news and the first day of school in the Roaring Fork district did not escape many local educators. “Just a few hours into the new school year, … many feelings of excitement were dampened by the announcement that the government will no longer accept new DACA applications,” wrote Roaring Fork School District Superintendent Rob Stein. “This announcement directly impacts many school district students, alumni and staff members who are working and studying legally under DACA, as well as many of their family members. It has ripple effects for the entire community. “Without DACA, some of our students’ dreams of pursuing college and career pathways were threatened today,” Stein wrote. Despite this news, Stein said RFSD’s immigration policies remain unchanged. “Regardless of where they are born, the languages they speak or the economic or social standing of their families, children do not have the physical, intellectual, financial or legal means to make decisions on where they live,” Hauser wrote in a statement. “Innocent of any wrongdoing, they should not be treated as criminals and should be allowed to acquire a college education.” Hauser said that hundreds of CMC students enrolling each year are Dreamers. Hauser joined 600 other college and university presidents Tuesday in signing a statement of support for DACA, pledging to press congressional delegates and elected officials to find a permanent solution for dreamer students. She suggests that undocumented students, despite DACA being rescinded, should try to use Colorado’s ASSET law, which allows undocumented students to pay in-state tuition at Colorado colleges. Clark emphasized that young immigrants should continue pursuing higher education through the ASSET law. DACA was essentially just a work permit, Clark said. It did not entitle Dreamers to any government benefits and students were still not eligible for federal student aid. CMC staffers at the Glenwood rally encouraged Dreamers to pursue scholarships through the state and through colleges, and they urged residents to push scholarship providers to expand eligibility to all students, regardless of immigration status.